Why ambient? A math teaching style that’s whole and all encompassing, with themes that repeat many times through the years, is most likely to be effective and successful. Today’s post will continue with the Common Core Standards for Grade 1, listed in blue and followed by their ambient counterparts. 4. Understand subtraction as an unknown addend problem. For example, subtract 10 – 8 by finding the number that makes 10 when added to 8. The unknown number concept works well with the color strips. Using this example, place the two strips, green (addition) and blue (subtraction) next to each other. Place 8 gems or counters in the first square and 2 in the second. The white square is third for the answer: 10 gems. Place 10 gems in the first square and 8 gems in the second. The white square is third for the answer: 2 gems. ___ + 2 = 10, 8 + ___ = 10. Or ___ – 8 = 2, 10 – ___ = 2. 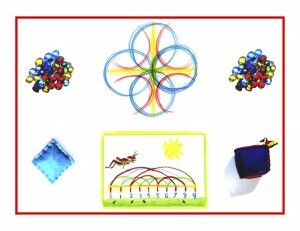 Continue with many similar equations, all under 20, using the gems or counters. Transition to working with the real numbers before writing the equations. Place 6 gems in the first square and 2 gems in the second. The white square is third with the answer: 12 gems. Place 12 gems in the first square and 6 gems in the second. The white square is third with the answer: 2 gems. ___ x 2 = 12, 6 x ___ = 12. Or ___ / 6 = 2, 12 / ___ = 2. Work with equivalent and inverse equations by comparing addition with multiplication and subtraction with division. Using the colored strips to see all 4 processes together in various relationships is working from the whole to the parts. This is most beneficial, as is having the colored strips and white squares take the place of the operation signs at first helps not only to simplify the process but also relies on the visual aspect, which is so much more effective than abstract symbols at this age. Knowledge ensues in an environment dedicated to imaginative, creative knowing, where student and teacher alike surrender to the ensuing of that knowledge as a worthy goal. More on the Common Core Grade 1 Operations and Algebraic Thinking Standards along with their ambient counterparts tomorrow!